With vacations in full swing and most people doing all kinds of summer-related stuff, August is usually a slow month around here. Still, there are those of us who play Sega games all the time, and we managed to find a solid group of titles to share this month! Read on and see what we’ve been playing! Many of the early Genesis titles still interest me to this day, as they have a certain style to them that will always remind me of a time when 16-bits was brand new. Mystic Defender was a solid title that really sold me on the power of the Genesis, with its neat fog clouds and amazing (for the time) parallax scrolling in stage four. I really enjoy the soundtrack as well; it gives the game an ambiance that is both unique and captivating. Mystic Defender likely has the most personality of all the launch window Genesis releases. Its prequel, Spellcaster, plays and looks differently in most respects, and I would have liked the 16-bit sequel to have included its RPG elements, but overall, I think Sega gave us a great installment that should have been revisited before the console faded away. The franchise returned on the Saturn, but another Genesis game would have been aces. 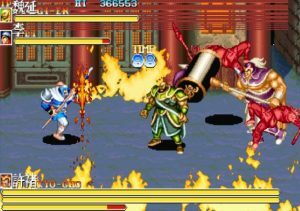 Tenchi wo Kurau 2 or Warriors of Fate, the beat ‘em up from Capcom, is yet another Japanese exclusive arcade port that should have come out in the U.S. and Europe but sadly didn’t. Set in ancient China, you’ll chose from five different characters, some with hand to hand attacks, others with weapons, to do battle with the usual evil warlord and his army of swordsmen, spearmen, bowmen and some women that need a good duffing or slashing up to win the day. Along the way, you can grab extra weapons so that those characters who don’t have one can wield one for a limited time. Those who have a weapon already can dual wield, albeit slowly. There are several horses that you can leap onto and proceed to charge into large groups of enemies, swinging your weapons wildly to smack as many as you can. This tactic is quite useful during the many boss battles, as they are usually accompanied by their own small army of minions. Warriors of Fate also has a great rousing soundtrack that makes you feel as if you’re liberating the land from an evil army while slashing, stabbing and jump kicking your way to victory. While we missed out on a Saturn port of Golden Axe: Death Adder’s Revenge, Warriors of Fate is darn good alternative if you can find it for an affordable price. This is a game I had been meaning to play for quite some time but finally just got around to it this month, and it interested me purely because of its subject matter. I wouldn’t say I’m a huge fan of gross-out humor, but it doesn’t bother me and I was curious how it would be implemented in game form. For the most part, the implementation was done well, including some clever power-ups, good animation, respectable backstory, and solid music. However, the gameplay was lacking, and for me that dragged down the whole experience. Despite different environments bosses, everything felt similar to each other, resulting in a game that felt like a generic ’90s platformer, and I became easily burned out. Thankfully, there is a password system that makes it easy to complete Boogerman in multiple sittings as opposed to one. This game is a nice little way to revisit the ’90s for a while, but it isn’t something I’ll be replaying regularly. I really love Super Thunder Blade. While I picked this game up several years ago, it captivated me in a way very few of the super scaler-type games have (save for Burning Force and the excellent OutRun). But why? Looking at this game as objectively as possible, the game really is nothing spectacular. The colors are a bit drab, even for a launch game. The way the helicopter controls feels slow and wonky, with a bit of a delayed response, it seems. The hit detection is suspect at best, and the scaling is extremely choppy. In fact, when you really think about it, this game doesn’t have anything to offer over the other titles in this genre. However, there’s just something about Super Thunder Blade that keeps me coming back. The main draw here for me is the atmosphere it creates. The music is fun, and although the game is not particularly vibrant, the color combination chosen for each stage is interesting and oddly appealing. The environments in each of the stages are also intriguing, even if they don’t make too much sense in the grand scheme of things (for example, you start in an urban city, then in the following stage you’re travelling in and out of caves in a desert). There are also a few small details that I think are neat, such as the water ripples when the helicopter flies too low in stage three. So yeah, Super Thunder Blade is a game that gets a lot of attention from me! I also had not previously made a point of playing the new Spring Valley repeatedly to build up Nightopians and increase their happiness levels, so that the music evolves to become better. It’s been great to see and hear this happening lately, as I’m a big fan of the winter music (not the Christmas music, but the music for the rest of winter). I’ve been making notes of all the content on this disc, and I may end up submitting it to the site, as a thorough review of Christmas NiGHTS. I also gave a few days’ free time to Link Attack mode, which means that we fly around a small course repeatedly, with the only goal of collecting items continuously – that is, keeping an ongoing “Link” of item-collection. So, we end up just flying as frantically as possible around the small course over and over, with our speed being the only thing that really matters. It’s fun and rewarding once we start getting it to work, and I got up close to 500 “Link” (which means I kept it going for maybe three or four minutes). However, the slightest imperfect movement can throw us off-course and break our Link, and I still find that my Link seems to get broken randomly, even while I seem to be doing well, and collecting items as fast as possible. Maybe it’s a small nudge of the 3D D-pad in an awkward direction, or maybe it’s a lack of momentum, in certain cases. Or maybe it really is practically random when our Link breaks, sometimes! 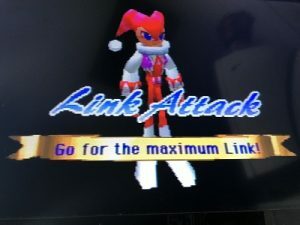 Whatever the exact reasons are, I have not mastered this mode, if that is even possible, and I started to get the impression that Link Attack was pushing me to the edge of my physical performance! I found my hands fatiguing and cramping from gripping the 3D Control Pad so tight (in efforts of making perfect movements), and my left thumb started to blister from pressing so intensely on the 3D D-pad. The Saturn’s 3D control pad is usually very comfortable and ergonomic, so this just shows the intensity of gameplay in efforts to make an ongoing Link of perfect movements. With sore hands and forearms, I had to let this go, at least until I recover a bit! @Ken Horowitz – What do you mean when you say the franchise resumed on the Saturn re: Mystic Defender? Both SpellCaster and Mystic Defender are based on the manga and OVA series Kujaku Ou, but they aren’t actually direct sequels, which is why they don’t play the same. The adventure segments in Spellcaster are an abridged version of the first Kujaku Ou game on Famicom & MSX2, released the same week. 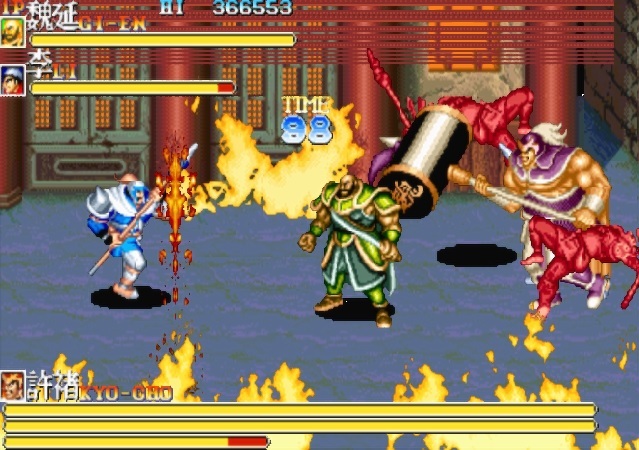 (Source: http://www.hardcoregaming101.net/spellcaster/) To my knowledge, there is no Kujaku game on the Saturn, or any other console after the Genesis. Did you have another Saturn game in mind? I’m a fan of Mystic Defender. I, too, wish there’d been sequels (especially on the Genesis).